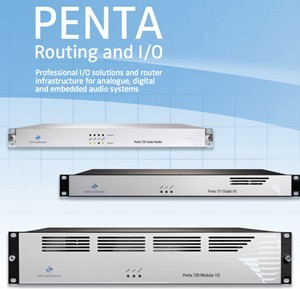 PENTA 720 is a new generation of audio router and audio distribution interfaces from NTP Technology, which provides a versatile and flexible interface for signal distribution of analogue and digital audio via AES/EBU, MADI, SDI SD/HD/3G embedded audio as well as routing via IP Gigabit Ethernet and optical fibre networks. PENTA 720 is a 2U modular audio interface designed for use in television or radio studios, outside broadcast vehicles and public-event venues. It comes with eight channel AES3 input/output channels, MADI and two IP Audio Ethernet in/outs. Up to eight optional cards can be incorporated to match specific operational requirements. The range of available plugincards includes an eight-channel analogue input interface, eight-channel analogue output, two-channel SDI/HD/3G embedder interface and a two-channel SDI/HD/3G de-embedder interface. All cards support hot-swop. A mini-module slot is available for dual SFP MADI optical input/output module, which is also compliant to the NTP HotLink/Dual MADI format. PENTA 720 include a 1024x1024 multiplexer,enabling all analogue and digital inputs and outputs to be routed in any combination; this enables the unit to also split signals for advanced signal distribution. The multiplexer can be used to establish the static connections of the signal inputs and outputs, and furthermore it incorporates soft switching with a fade down and fade up functionality of the signal level. Soft switching ensures that setting or changing a signal path can be made without any audible click or artefact. The PENTA 720 IP Audio protocol is based on the robust tried-and-tested Dante™ digital audio networktechnology, and will interoperate with products of other brands that comply with Dante. The Dante IP Audio format provides fast, flexible, andeconomical audio routing via IP and is compatible with NTP PENTA 721 Digital I/O and other Dante devices. The IP Audio routing provides Low latency, tightly synchronised, transport of uncompressed audio over Gigabit IP Ethernet Layer 3 networks using off the shelf switches, and routers for audio routing via one or more sub-nets. A total of 512 channels can be routed on a 1 Gigabit network, and more if the network capacity is higher. Dante is the ultimate choice for High Reliability and High Performance Audio Routing and Audio Processing. Small in size, but big in performance. 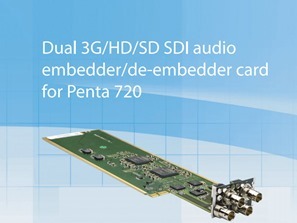 The all digital Penta 720 is developed with the newest technology in FPGA, SMD and software design. Featuring single or dual processor. Ultra compact, ultra fast, ultra reliable. Reliability, innovation and years of experience. PENTA 720 are TCP/IP controlled via one or two Ethernet ports. Control and supervision can be made by the NTP RCCore control system, and the operation is done via the NTP VMC control software client applications. A simple dedicated software control application for Windows is available for controlling and setting up PENTA 720 on a unit to unit basis when less advanced operation is required. The IP Audio routing is for larger systems controlled by the NTP RCCore Router Control System, for easy and simple setting of connections on the Gigabit IP Ethernet. PENTA 721 can also be controlled by the Dante IP Audio routing controller software.